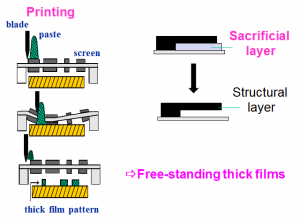 Using the association of the low-cost screen-printing technology with the sacrificial layer method, totally released piezoelectric thick-films microceramics of electroded PZT type are fabricated. 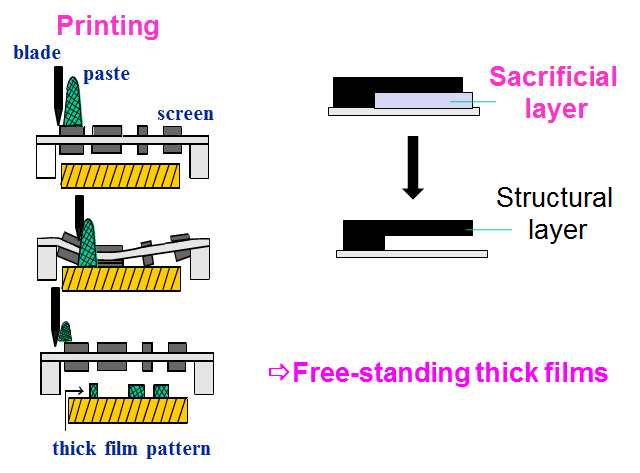 After the deposition of the sacrificial layer on a substrate and subsequent printing and drying of bottom electrode, PZT and top electrode layers, the final firing is performed at low temperature (<950°C). This is followed by the releasing step of the Au/PZT/Au in diluted acidic solution. This new process might lead to lower cost than traditional ceramic process for PZT-based sensors/actuators manufacturing (no needs for slicing and polishing piezoelectric ceramics prior to electrodes deposition). Impedance analysis shows that the electrical properties and electromechanical coefficients of poled PZT thick-films are similar to those of PZT ceramics. Moreover, evaluation of the performances through sensor and actuator configurations as well as EMI measurements confirms the potentialities of straightforward electroded PZT components for Structural Health Monitoring (SHM) applications. For this application, embedding in a resin should be intended.